Last month I was messing around with ol' good Exoddus' memory table on emulator, and the goal was to grant Abe access to his fart tool from the start of a new run. Any time and for an infinite amount. Using CEP, I've started my research at FeeCo. Depot and eventually found the right address to freeze. Next time I loaded my file, the cheat weren't working. Turns out game chooses a new address in 4 bytes offset randomly, left or right, of a certain region with every file load from Main Menu. From the very start Abe has access to a generic "ammo" counter generated within current level data, and that data changes its location in memory upon loading next level (map). It means that without some complex hacking tools, IT'S IMPOSSIBLE TO HACK COUNTERS SINCE THEY'RE THE PART OF A LEVEL ITSELF, with an exception of farts' global counter - which sometimes remains active even if affected memory region is completely blank. But it would eventually crash the game when new level data gets loaded in there. Step 1. Load the "dispenser" on screen (Meat sack, bone sack, grenades vendor, brew vendor). It writes some disposable data for further use. 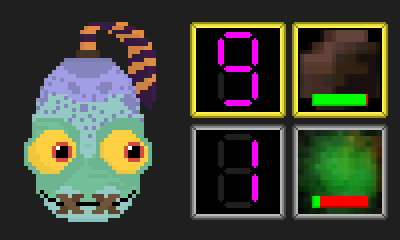 For the brew vendor, player equips ammo automatically upon object load. A few moments later data related to utility in steps 1 and 2 gets wiped, forcing player to repeat whole process. Interestingly, screens adjacent to source keep used up data static until Abe moves to the other screen. Let's talk about them. [Normal] The screen where's vendor object is placed. Provides player with physical ammunition. [Hacked Digi-counter] Farts/missile ammo won't deplete if exceeded physical limit. [Hacked Digi] Farts/missile ammo won't deplete if exceeded physical limit, either. [Hacked Digi] Depletes ammo normally. In case of farts their supply is unlimited as long as SECRET COUNTER THAT KEEPS TRACK OF FARTS AMOUNT ON SCREEN (BOTH EQUIPPED AND PRIMED) is above 0. Once empty, doesn't render ordinary fart green until "Digi" set back to 0. Exceeding missile limits results in graphical glitches, tele-glitching to another screen, freezes and crash. [Normal] Strips the player off farts and missiles data they get prior reaching that screen. [Hacked Digi] Unable to use any weapon, empty. Glitches and crashes similar to DEPLETE screen. So I wondered, "What NO FUN screens are there for?". "To prevent players from cheesing the challenge, obviously" - you say. But what if tell you there's more to it than meets the eye? That these vendors unlike other dispensers are able to TURN ALL DEPLETE SCREENS ON A MAP INTO FUN ONES! Through some experiments with hacked Digi-counter I found out that loading the file saved in DEPLETE zone, heading to the brew machine and back granted Abe with infinite gas-bombs, it even prevents THE SECRET COUNTER THAT KEEPS TRACK OF FARTS AMOUNT ON SCREEN (AND EQUIPPED) from hitting zero. I tried many times to carry the effect through NO FUN zone, and with no success. But just once I've managed to glitch it the way I could use gas-bombs infinitely at Terminal 3 (to Slig Barracks) as if it was still under effect of the vendor. So there you have it! I hope you enjoyed reading my research as much me sharing it. 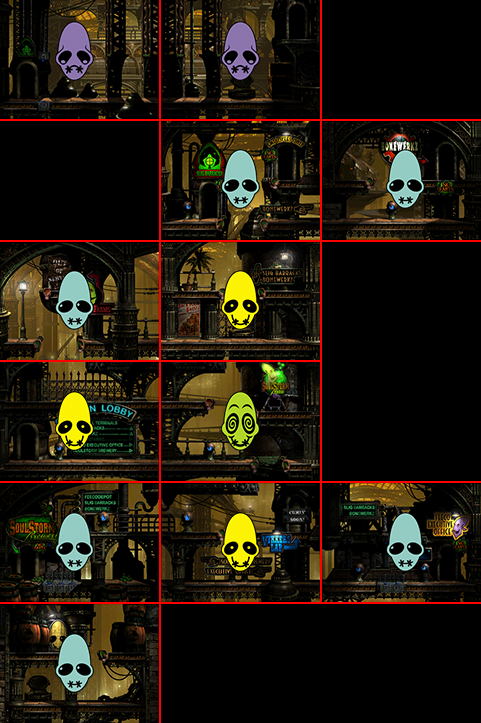 And again, Credits to SUPERFLOMM from Spriters Resource and Brecht Lecluyse for map rip and HD Mudokon emotes. Last edited by Ale's; 10-24-2018 at 05:06 PM.. This is actually really interesting, good job on this.